An unexpected pint of Orkney Dark Island. Decent too. Not many in as we got close to the ungodly hour of 10:50. A typical LDN pub experience that didnt stand out in any way, despite being a GBG entry. Listed in the 2016 GBG & I finally got a chance to visit just before Christmas. The last time I was here the pub was an O'Neils and pretty bog standard it was too. Its now a Nicholson's pub with 7 ales on the 8 hand pumps. Most of the ales were from National brands and can be found almost anywhere, apart from the Christmas offering from Thornbridge which was Wild Holly @ 4.8%. At 3.30pm on a Thursday afternoon the pub was packed and there was a good atmosphere. Lots of chatter above the non descript music that was playing, pleasant bar staff, neat decoration and a good location. Certainly worthy of another visit. 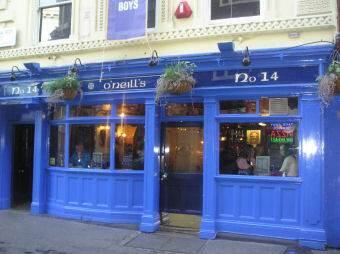 I remember coming here previously when it was an O'Neills. Now it belongs to Nicholson, it has a better range of ales. Yesterday, they had Fullers London Pride, Woodfordes Norfolk Hawker, Artisan Amarillo, Hogsback England's Glory, Thwaites 13 Guns & Nicholsons Pale Ale. Unusually for a Nicholson, they also had Thatchers Heritage cider on handpull. There is a reasonable size downstairs bar, with a dining room upstairs. The toilets are another storey up. 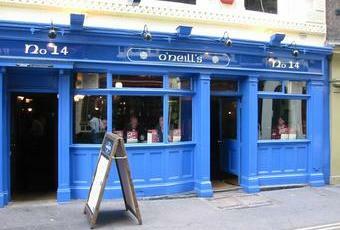 Its amazing how many pubs Nicholsons have taken over in central London. But I still quite like their brand. Nicholson's owned pub with very old, characterful interior. Ever changing selection of ales plus the very tasty Outliers Blonde from Aspall's the cider makers on draught. Friendly, knowledgeable staff. As you'd expect from a central London pub, not the cheapest with a beer around £4 a pint. From memory there were a decent range of ales and the pint I had from Orkney was nice.